I would like to thank all that entered my blog challenge! Everyone did such a great job and were so creative with their ideas! The judges had a rough time choosing one card! It came down to two finalists and I had to call in some reserve judges to then choose a winner from the finalists. The card that won was chosen on the creativity fo adding the picture! The judges all liked the idea of seeing people in the window. One commented that they felt like they wanted to be there with the people. So congrats MaryNSC!! 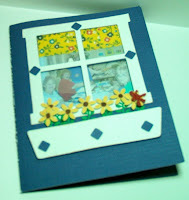 You are the winner of t he Planter Box Window Card challenge! This is so dang creative!!! Very deserving winner That is a great card. Great card!! You took it to the next level way to go! Okie is it possible to post all the entrys on your blog so we can get some ideas?? Yeah Mary! Way to go! I love the photo...great idea. Okie, I concur with Dawn...any chance you can post a pic of all the entries? Sure would love to see them. P.S. hope your not scratchin anymore.